Welcome to the Holiday Inn Express Hotel and Suites Andover, KS! 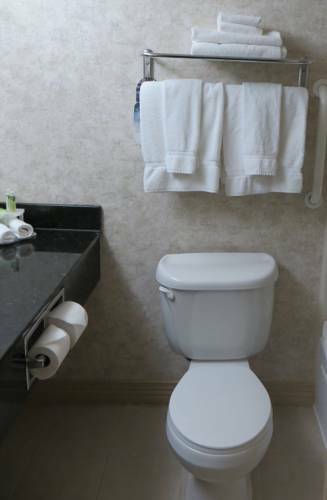 Ideally situated outside of East Wichita, our Andover, KS hotel is close to Wichita Mid-Continent Airport, Jabara Airport and major businesses, restaurants and attractions. Visitors to our smoke-free hotel in Andover will find a beautiful oasis. Waterfront dining in Wichita is just a few miles away as is the Wichita Art Museum. For sports fans, the Flint Hills National Golf Club, the Kansas Sports Hall of Fame and Stryker Soccer Complex are nearby. Families can enjoy a science exhibit at East Wichita's Exploration Place or observe the exotic wildlife at the Sedgwick County Zoo. Corporate guests will find our hotel's location puts them within an easy drive of the many businesses nearby. The Sherwin-Williams Training Center, Flight Safety International and Hawker-Beechcraft Corporation are less than five miles away from the hotel. Other companies such as Boeing, Coleman, Koch, Raytheon Aircraft, Cessna Aircraft, Spirit Aerosystems and Bombardier Aerospace are just a short distance from our Andover, KS hotel. This beautiful, Andover hotel offers guests the best in service and amenities. There's a heated, indoor pool and a well-equipped fitness center. You can relax on our patio overlooking the pond or in front of the lobby fireplace. The business center, free high-speed Internet access and complimentary, hot breakfast make this a smart Andover, KS hotel deal. Poplar Restaurant: A local favorite. Poplar serves something for everyone ranging from home style chicken fried meals, to Mexican, to Italian flavors. They have a full stocked bar to help you wet your whistle. Applebees: One of America's favorite restaurant chains with car side to go for those late night snacks. DillonsGourmet grocery store and several restaurants within walking distance.